Please help save our beautiful protective granite ridge just outside of Bancroft, Ontario! We’ve appealed Faraday Council’s decision to approve the Freymond Lumber quarry! Our appeal was launched with the Local Planning Appeal Tribunal (“LPAT”, formerly the OMB). Our submissions were excellent and provide a clear roadmap to stopping the quarry. There are lots of outstanding issues that haven’t been addressed. Traffic safety, noise, First Nations consultation and water, especially protection of our water remains a concern. On March 19, 2019, we will be appearing before the County of Hastings to plead our case once again, to stop them from voting to proceed. And, the Ministry of Natural Resources and Forestry must make a decision on a license under the Aggregate Resources Act. So, there’s lots to be done, experts to hire, evidence to gather and people to organize! Canada has "~20% of the world's total freshwater resources. However, less than half of this water -- about 7% of the global supply -- is "renewable". The other 13% of non-renewable freshwater lives in "fossil water retained in lakes, underground aquifers" - just like the limestone lake system and aquifer in Faraday, Hastings County, Ontario. Unfortunately this non-renewable water is under threat by applicants Freymond Lumber and Fowler Construction. They want an aggregate quarry on the same vicinity as this lake system and aquifer. According to our expert, it's a very real possibility that they could unwittingly blast fissures (cracks) into this water source and compromise our local lakes and springs. An economic impact study has not been completed as to how local businesses will be affected, nor has the 15-25% typical decrease in property prices seen in other communities been considered. 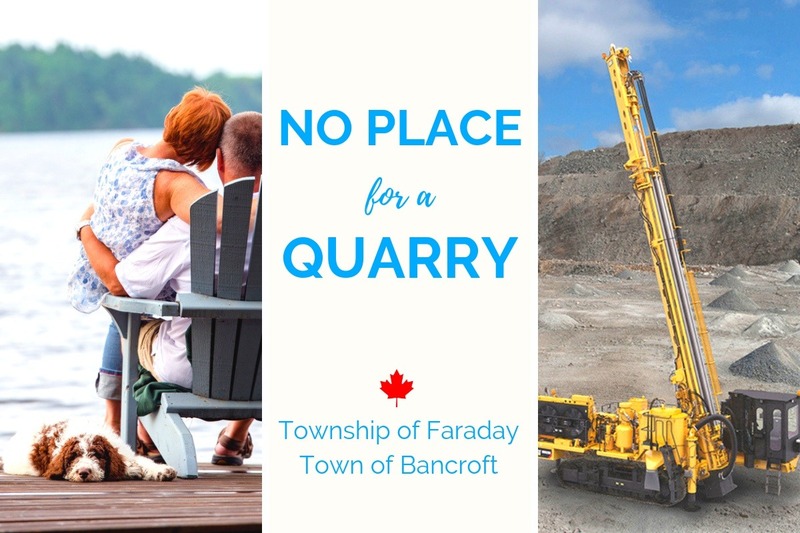 Further still, residents' level of satisfaction with the quarry has not been surveyed, nor their priorities for the future of the community's economy. The appropriate processes to ensure no economic or environmental harm could come to this area have been glossed over. Our local elected officials are paid to protect visitors and residents that have to live with the day-to-day risks of traffic, noise, dust, life-threatening fly rock, loss of property value risks from the quarry for next 50 years; and possibly live forever with the potentially irreversible consequences of the quarry to the water system. We’ve created this fund for public benefit: to protect a precious water resource - and to demand a safer, quality assured process. Please join us!